1. For lovers of old houses and those trying to restore them, the 1880 Queen Anne-style house at 310 West State Street, dubbed “The Tibbetts-Rumsey House”, is offering a tour of the renovations later this month. The tour, which starts at the front entrance at 11 AM on September 22nd, is free, but registration is required; if you’re so inclined, and since late September in Ithaca is generally a pretty nice time of the year for weekend outings, you can register here. The plan is to restore the house into a nine-bedroom co-op style living space, with a new six-bedroom co-op unit in the rear of the property. The 3,800 SF residence was designed by local architect Alvah B. Wood and built by contractor John Snaith (of Snaith House) in 1880. Wood, a Cornell classmate of the more famous architect William Henry Miller, designed a number of prominent local structures, including the old Ithaca town hall at 126 East Seneca Street (built 1881, demo’d 2003, now the site of Tompkins Financial brand new HQ), the Immaculate Conception Church (1896) and the railroad/bus depot at 701 West State Street (1898). Union Army Captain J. Warren Tibbetts and his family were the first residents of the home. It was sold to the Rumsey family in 1885, and they owned it until 1966. 2. The medical office building near the intersection of Warren and Uptown Roads looks like it’s one step closer to happening. An LLC associated with Marchuska Brothers Construction, an Endicott-based firm that has been making inroads into the Ithaca market, bought the 2.71 acre lot and the plans from Arleo Real Estate LLC for $470,000 on the 27th. A sketch plan was presented to the village of Lansing in February 2017 for the one-story medical office building, but no formal review was carried out after the site and plans went up for sale for $500,000. Marchuska is free to change the design as they see fit, so don’t treat the renders as final. The firm recently completed the renovation of a former manufacturing facility on Craft Road into medical office space primarily leased by Cayuga Medical Center, and are the general contractors for the Tompkins Center for History and Culture project. 3. The tiny houses project at 16 Hillcrest Road in the town of Lansing is over for the time being. The town Zoning Board of appeals shot down the variance required for the lot, which is zoned industrial/research due to what is essentially a boundary line quirk. The reason cited isn’t that they don’t like the project, but rather that they don’t think it meets the intent of ZBA variances. The neighbors were opposed to the 421 SF homes, but were okay with a duplex, which could arguably be worse for them because one could build a pair of 2,000 SF, three-bedroom units that could generate more traffic and have a greater environmental impact. Even moreso, if one fully utilized the 1.26 acre lot for an office or industrial structure, that would have much greater environmental impact than either residential option because the lot could be fully utilized within standard setbacks, meaning a larger structure and parking lot, greater stormwater runoff, commuter/work-related traffic, industrial noise and related activities. An argument can also be made that these small homes would have been provided a new affordable option in an area plagued with affordability issues. It’ll be a while before any zoning change is approved, and any challenge to the ZBA ruling is unlikely to go anywhere, so this proposal has been deleted from the Ithaca project map until a revival seems plausible. 4. Exxon Mobil is set to auction off a trio of parcels in the hamlet of Jacksonville. Tying into the story of the old Methodist church I wrote for the Voice last March, a major gas spill fifty years ago contaminated the groundwater and made the properties practically unlivable; after years of attempting to bring Exxon Mobil to task, the multinational energy firm purchased the properties, tore down most of the buildings except the church (after the town’s pleading), and basically sat on the lots with minimal upkeep. A municipal water line was later laid through the hamlet to provide clean water, and the gas has disintegrated and diffused with decades of time to safe levels, per the state DEC’s analysis. The town of Ulysses picked up three of the six lots, selling two to architect Cameron Neuhoff to restore the church into a residence and community space, and holding onto the third for the time being as it figures out what to do with it. The other three still owned by Exxon Mobil are the ones going up for auction. There is no reserve and the auction is set for 5 PM on October 17th. More information is available from Philip Heiliger of Williams & Williams Real Estate Auctions here. 5. Cayuga Heights is continuing with its review of the renovation and conversion of 306 Highland Road from a fraternity into a 15-unit apartment building. The plans have been slightly modified so that with the addition, the building grows from 3,400 SF to 4,542 SF (previously it was 4,584 SF). GA Architects PLLC of Dryden is the architect of record; their online presence appears to be bare bones, and may have previously gone by the name Guisado Architects – it looks like principal Jose Gusiado has done a few homes in the Dryden and Lansing areas. Former Cornell professor and startup CEO John Guo is the developer. 6. Here’s a rough timeline for the Green Street Garage preferred developer decision – the Ithaca Urban Renewal Agency’s Economic Development Committee is expected to rank the projects in order of preference by September 14th, discuss it at the September public hearing, hold an Executive Session with Common Council in October, and formally designate a preferred developer by October 25th. From 11/1/2018 to 2/1/2019 there will be an Exclusive Negotiation Agreement (ENA) between the preferred developer and the city, which is a designated time to negotiate details regarding sales and development of the site. This serves as the basis for a Disposition and Development Agreement (DDA), which would be reviewed and approved by the IURA EDC by the end of February. From there, the Planning and Economic Development Committee of the Common Council will hold their public hearing and vote in March, and the full Common Council at their April 3, 2019 meeting. It’s a long and complex process, but the goal is to have the major details sorted out by that preferred developer designation on October 25th – given the garage’s degraded state and limited life span remaining (two, three years at most) and the time needed to stabilize the structure and determine continent measures for any rebuild, having either side pull at late in the negotiation would be very problematic (suing the city during any stage in this process is never a good idea). Hopefully everything works out between the city and its choice of developer. 6. Not a whole lot of new and interesting coming public at the moment. A new “Dutch Harvest Farms” wedding barn at 1487 Ridge Road in the town of Lansing looks interesting. Tapping into the trend of using barns for wedding receptions, the 50.44 acre property would host a 7,304 SF pole barn, pond and associated parking and landscaping improvements. The facility would be capable of hosting up to 160 people on-site. The plans are being drawn up by local architecture firm SPEC Consulting, and the intent would be to build out the $750,000 project in the spring and summer of 2019. 7. Bad news for the Ithaca Gun site; a remedial investigation by the state DEC indicated that there is still enough lead present on the property that it poses a significant threat to public health. This doesn’t necessarily derail plans for the redevelopment by Travis Hyde Properties, but the DEC will need to conduct a review, make recommendations for cleaning, and sign off on any cleanup effort THP proposes. 8. A follow-up on the Ongweoweh Corporation news note from a couple weeks back – although they didn’t respond to my inquiry, they did respond to the Journal. And the move to the larger digs in Dryden comes with 25 to 50 new jobs in Dryden over the next few years, so while it may not have been my article, I’ll gladly share positive news. 1. For those of you looking out for something interesting next week, here’s your notice. In the village of Lansing Monday night, a sketch plan is set to be shown involving a cluster home development on the remaining phases of the Millcroft property, about 40 acres off of Millcroft Lane and Craft Road. According to the agenda, the proposal comes from Ithaca-based landlord/developer Beer Properties in partnership with Hunt Engineers. The back story here is that the Millcroft subdivision was approved in the mid 2000s as a three-phase, 31-lot development for high-end ($500k+ homes). As it turns out, the market for that, absent lake views and on relatively small lots, isn’t so great. The Great Recession didn’t help either. The first phase of 14 lots is mostly built out, and the second phase was approved and shows up on town maps, but no construction has taken place. The village has been aware of a project in the works since at least February. Unfortunately, I can’t seem to find the property listing for the land, which was on Zillow for quite a while – I recall a figure around $850-$950k. 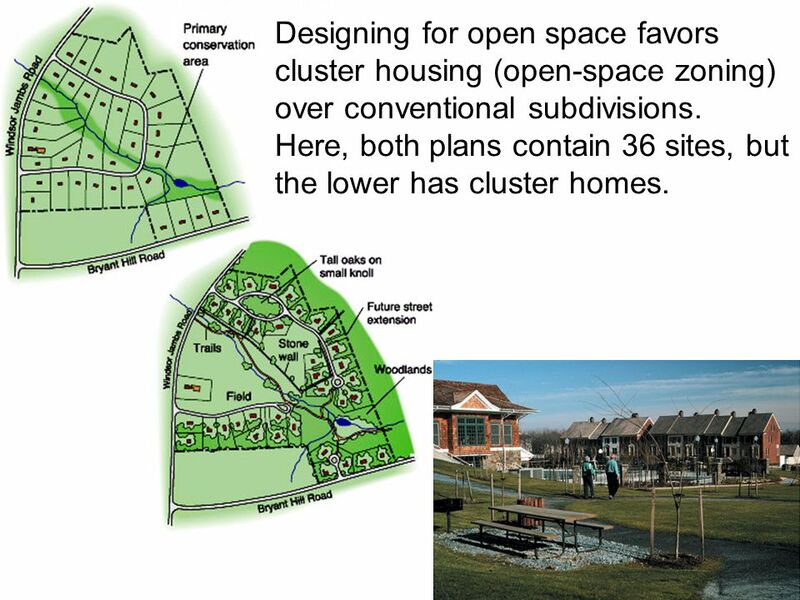 The property falls in the village’s medium density residential zone, Cluster zoning means the lots themselves are smaller to preserve natural space. However, the maximum number of units is the same as maximum allowed by regular zoning – 40 acres in sewered Lansing village MDR means up to 87 units, if I’m doing the math right. Not sure if single-family, townhome or otherwise, so keep an eye out for a follow-up. 2. For sale, 15.31 acres off of Wellsley Drive in the village of Dryden. Sewered, watered, and originally planned for 36 homes but never approved. Price of the land $149,900. Here’s maybe the more interesting part – this borders Maple Ridge. Maple Ridge’s first phase is built out, and the developer, Paul Simonet, would like to build the roads and lay out phase two (and eventually phase three). However, the village’s issue is that there’s only one entry and exit into the development – something they’ve been hesitant to sign off on because of possible safety/access issues. Now, this may have already been resolved – the village of Dryden has only updated their website twice since February, with legal paperwork for keeping fowl – but if not, there’s the option of buying the Wellsley Drive property and routing a road through there. Maybe $150k plus the extra road work isn’t in Simonet’s price range, but it’s at least an option. 3. The village of Trumansburg commissioned an independent study from Camoin Associates (the same folks who did the Airport Business Park study) looking at the financial impacts of 46 South (formerly Hamilton Square) on the village. I’ve been told this wasn’t public yet, but it’s on the village’s planning board webpage, so I dunno about that. Quick refresher: 73 units. 56 affordable, 17 market-rate. 6 affordable rental townhomes, 40 apartments, 10 affordable for-sale townhomes, and 17 market-rate units, single-family and townhome style. 140 residents at full buildout in 2023, assuming one per bedroom. Here’s the TL;DR on the finances. The net income to the village itself is -$23,757/year when fully built out. The unfortunate truth of residential development is that, frankly, people have needs. They use roads, they call police and fire, they use municipal power lines and water pipes and sewer mains. It is not offset by the village’s share of property taxes, here in this mixed-income example, or in the vast majority of cases. This is a reason to advocate housing density, because the impacts on, say, building new roads or infrastructure is often less per unit. On the flip side, the school district, which makes up a greater share of the property taxes, sees a net increase of $97,669/year when fully built. Tax revenue more than offsets the expenditure of approximately 33 new students. Not everyone living in has a child, but everyone pays school taxes. This money not only helps the district, the incoming students help ameliorate concerns that declining enrollment may soon lead to consolidation with a neighboring district. Economic impacts can be broken down into three components – the construction jobs, long-term operation/maintenance, and growth induced by the new residents, who will not just live locally, they will also shop, dine and spend money in the village. There will be an estimated $18.17 million spent on construction, $1.45 million will be spent within the County, creating 20 construction job-years in total (note there are multiple guys on site once, the project is expected to be fully complete within five years), and nearly $695,000 in total earnings. Operation/maintenance in perpetuity creates the equivalent of two jobs, creating $60,732 in earnings and $229,782 in sales. The households will spend nearly $1.7 million yearly within the County, which will support 20 total jobs with over $676,500 in earnings per year. In other words, $2 million spent in the county, 22 jobs and $737,500 in net new earnings from having those 140 more residents in the village. By the way, if one was inclined to read 289 pages of public comments about 46 South, that can be found here. The project will be discussed at the village board’s meeting Monday evening. 4. Let me note this before I forget again – Park Grove’s Bomax Drive Apartments have started construction. The first two strings of 10-unit, three-bedroom townhomes are expected to be completed by Spring 2019. I’ll make a site visit soon for a longer write-up. 5. Meanwhile, the Triphammer Row townhomes are on pause until the road situation gets worked out. The village won’t sign off on using M&T Bank’s parking lot as an entry route, and the Sevanna Park condos don’t want to allow access to the 15 units through their private road. As a result, the village is seeking to have the road turned over to them, in part to encourage this for-sale plan, and in part because will ownership of the entry road to Sevanna Park will allow them to install better curb cuts and traffic control. 6. Here’s a for-sale property with some small-scale redevelopment potential, this one in the city of Ithaca. A dilapidated house is for sale at 815-17 North Aurora Street in Fall Creek. thanks to unsympathetic additions, the historic value is marginal. A buyer could restore it, or if interested, since it’s a double-lot, they could split the lot in two and do a two-family home on each property. Given other recent projects in the area such as 202 and 204 Queen Street and 128 West Falls Street, it appears to be an opportunity to do some modest densification keeping with Fall Creek’s fabric without upsetting the community too much in the process. The property is for sale for $269,000. 7 Let’s tie this up with something intriguing. Next week, the city’s Planning and Economic Development Committee is being asked to support a grant application by the Downtown Ithaca Alliance to the New York Main Street (NYMS) grant program. They are seeking $322,500 from the state to leverage work on four downtown projects – a commercial project in the Clinton House, a commercial project in the Boardman House, a “commercial and housing project” at 108 West State Street (the Ithaca Agency Building), and a 12-unit development by Visum Development in the West State Street Corridor. Any rehabbed housing units will be required to be 90% area median income for at least five years, but I dunno if either housing plan has existing units, I think the Ithaca Agency Building was all office space. STREAM Collaborative just moved into the second floor, so they would know best. Quick postscript here – there’s nothing but an outline according to the DIA’s Gary Ferguson, so no Voice writeups for a while yet. 1. It looks like Cayuga Orchard will be moving forward this spring. At the moment, the 102-unit apartment project is going up for a few tweaks to the town of Lansing planning board, mainly just to get approvals for a pair of monument signs. Whitham Planning and Design is handling those last details. The project already went out for construction bids, and with a cost estimated at $25 million, which will surely help Lansing’s bottom line. With no tax abatements, and about $26.50/$1,000 assessed, the back-of-the-envelope suggests about $660,000 in taxes (however, using the hard costs alone is likely low-balling the tax assessment). The project is able to move forward thanks to a plan to pay for a sewer line extension to meet the needs of residents; the plans had long been held up by issues and red tape regarding a modular on-site sewer treatment system. On the site plan, from left to right, are three roads – to be named “Harvest Drive”, “Blossom Road” and “Liberty Lane”. Positive connotations as most are, except one case I know – here’s a story of a downstate project where the Staten Island borough president used his right to rename roads to give a project names meaning deceit and greed. Liberty Lane is designed to be extended for whenever local developer Jack Young decides to go ahead with his 117-unit “English Village” single-family home and townhouse project on the 100-acre property to the west of Cayuga Orchards. Right now, Young’s focus is on a few home lots he’s subdividing on East Shore Circle. The housing is intended to be rentals in the upper-middle (premium) market, and the 26 1-bedroom and 76 2-bedroom units are welcome in a community with a tight housing supply. As for the design…meh. It’s not terrible, but the dispersed home strings and front-facing garages over-emphasize suburban aesthetics (nothing against Stampfl Associates, they actually have some neat projects). Look for the first units to come onto the market in Spring 2019. 2. For sale, another chunk of Ithaca’s near-waterfront. 798 Cascadilla is a 18,271 SF one-story flexible office space building that was renovated in the 2000s, and is home to Palisade Corporation, a software firm specializing in decision making/risk analysis tools. Palisade is doing just fine, but this is a case where they might be sniffing out an opportunity. Consider the location. It’s next to Carpenter Business Park, which was just picked up by a team of businesses led by Cayuga Medical Center and Park Grove Realty, ultimately expected to be a large mixed-use development. That purchase was $10 million on a property that had sold for just $2.7 million less than two years earlier; a bidding war drove the purchase sky high. Next door, Guthrie Clinic picked up Palisade’s neighbors, a storage facility and a former printing press/warehouse of Cornell University, for $2.85 million, $150,000 over asking price. Paying at full or above asking price is pretty rare for commercial real estate in Ithaca. Guthrie has recently been in talks with Greenstar Co-Op to convert the storage facility into a new grocery store and cafe. In the City Harbor plans, where Guthrie and Greenstar are involved, there have been some site plan concerns note around issues like parking, that a purchase here could help solve. Zoning on the site is newly-minted “Market District”. Hotels, restaurants, retail, housing, healthcare facilities, food production facilities, and housing. Up to five floors/63 feet, 100% lot coverage. But honestly, given the recent PUD-OD proposal, zoning regulations are not the end-all, be-all; if someone wants to try for an additional floor by throwing in a few affordable housing units, they could. Not saying that’s a great idea, but they could. If I had to take a guess, Palisade is feeling out the market and seeing what kind of deal they can get for their building. It was an unusual choice of locations when they bought it in 2004, but they might make a tidy sum for being in the right place at the right time. Maybe. The asking price for 798 Cascadilla is $2.7 million. The tax assessment is for $2 million. Pyramid’s David Huckle is the sales agent in charge. 3. A long time ago, back in 2009, a West Hill property was talked of as a potential development site. Now that property has exchanged hands. For the moment, its future is still fairly murky. Kaderli Trade, a Panamanian business with Swiss ownership has owned a 68.5 parcel of land just west of Warren Place since 1977. The property is vacant, and assessed at $320,000. It just sold on Thursday to the Rancich Family for $360,000, a modest gain, and a pretty good price for vacant land. The Ranciches are probably best known for being the original planners of the Enfield Wind Farm, and for Carrowmoor, a mixed-use project that would have had retail space, office space and up to 400 units in clustered housing on a 158-acre parcel just northwest of Kaderli’s parcel. The motif was a traditional English village. Buildings would have aesthetic half-timbers and gable roofs. It would have used alternative energy (heat pumps were practically unheard of at the time) and been priced mid-market for for-sale units. However, this was 2008-09, the recession was biting hard, and Carrowmoor never moved beyond the drawing board. Most of the renders have disappeared, but I still have one from 2009, before I knew how to crop screenshots. Less known but still important, the Ranciches also played a role in the development of the Conifer Linderman Creek affordable housing. If someone were to ask what the development likelihood were based on the above information, it would get a shrug from me. The Ranciches haven’t had much success, but this purchase suggests they have some sort of interest, and the location is one the town has noted for potential development – existing zoning is Medium Density Residential, and the 2014 Comprehensive Plan plans traditional/new urban design medium density. That’s T3-T5 for the New Urban transect buffs, averaging 5-8 units/acre by the town’s count. It’s close enough to the municipal water that new pump stations and tanks wouldn’t necessarily be needed. In sum, the town would be open to something substantial. But who knows. 4. 46 South Street, this Claudia Brenner/INHS mixed-income mixed-use project in Trumansburg (Hamilton Square is no longer the official name) continues to go through the boards. My Voice colleague Kelsey O’Connor covered the Planning Board meeting on Thursday, where about ten people spoke for an against the proposal. It’s probably better that she cover 46 South, because I would find it hard to maintain impartiality. On the one hand, there is the opposition. The “Trumansburg Neighbors Alliance (TBNA)” turned in a Change.org petition with 492 signatures, along with paper petitions they say brings the number up to 669. 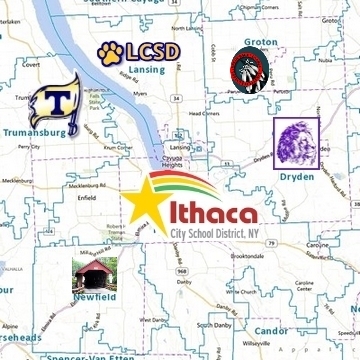 They say 432 are in Trumansburg, Ulysses, or the Trumansburg school district, which includes large sections of Schuyler County and Seneca County. From their Facebook page, they don’t have accurate numbers. At this time, there are actively trying to re-impose a village-wide moratorium after the previous decade-long moratorium expired. The zoning was revised in 2012 and re-analyzed in 2016. The South Street housing fits its zoning. There are plenty of others who have already spoken in favor of this proposal – the Lansing Star has had a harsh word for the opposition, and some residents in Trumansburg are speaking out in favor of the South Street housing. Too many rental units, not home ownership, out of balance and character with the neighborhood . 46 of the 73 units are affordable (LMI) rentals – most (40 of 46) are in the two story building in the middle of the property. Here’s the thing with lower-moderate income families; a lot of folks are getting by paycheck-to-paycheck. They don’t have the money for a 15% or 20% down payment on a house, for which the median sales price in Trumansburg in 2017 was $255,000, up 38% from the $184,500 in 2012. Thankfully, groups like INHS will work to cover the down payment and sell homes to LMI buyers well below market-rate, like the townhouses on Hancock going in the $110-$145k range, about half of the market rate for a new townhouse in Ithaca. However, funding for purchasable units is much more difficult to get. A bank isn’t going to fund a plan that doesn’t generate a good profit, so they have to turn to state and federal funds. The government is more likely to disburse a grant if it knows there are buyers waiting in the wings. And for low and moderate-income households, far more are capable of renting versus buying. In short, this argument boils down to ‘these people are too poor to live in our village’. 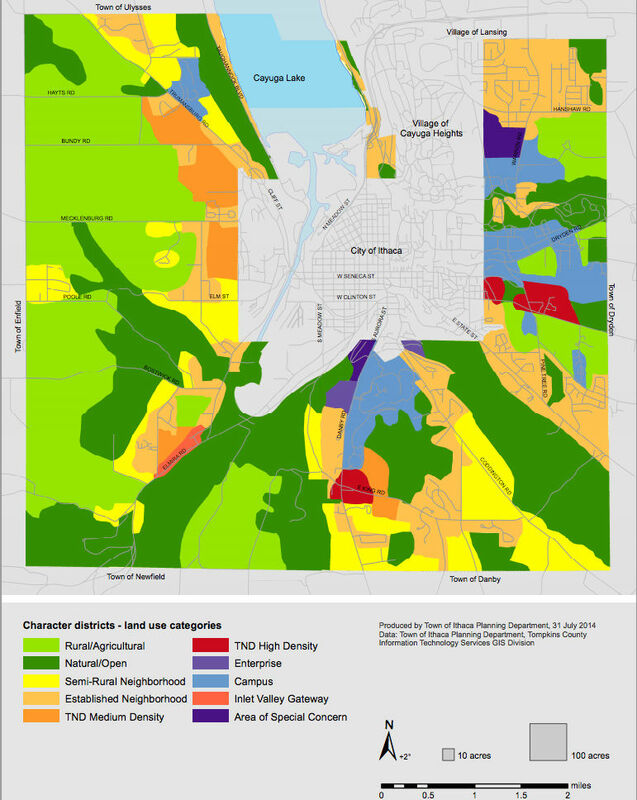 Character is always a bad argument to give a planning board; it overly relies on demographic perceptions, which include details like age, income and race. The 2008 Comp Plan notes historic buildings, non cookie-cutter design, and tree-lined streets. Homes are 1-3 floors. Well-designed multi-family buildings that fit the village fabric, especially those with design features friendly to seniors, were encouraged. Affordable housing is strongly encouraged. Below are some of the building elevations, pulled from the submission here. Let’s gauge based off the Comp Plan statements – there are no historic buildings on site, it’s vacant land surrounded by housing of varying ages. Designs incorporate porches, gables, bracketed eaves, dormers and other features of Trumansburg’s older housing stock. They are generally two floors. There will be several townhouse and single-family home designs interspersed throughout the site. At 40 units, the apartment building is not unlike the existing Juniper Manor; as with other INHS projects like Breckenridge Place and 210 Hancock, many of these units are expected to rent to seniors – about 60% of Breckenridge is seniors, and although I don’t have stats for 210, I’d say it’s a generous percentage. The project is 72 units, 140 residents, over a 19.12 acre parcel. That is 3.77 units/acre, 7.3 residents/acre. That is less dense than the older part of the village. Even the Tamarack/Larchmont housing, which is one of the areas of strongest opposition, has about 2.5 units and 7-9 residents per acre. So density’s in line, it has affordability within a mixed-income layout, the apartments are senior-friendly and designed to blend in; it meets the goals of the Comprehensive Plan. The developers did not ask residents how best to fulfill Village needs…they just decided! No, they didn’t. Remember the community meetings to get ideas and feedback last July? The August listening sessions? The major plan revisions in response to community concerns? They’ve been listening. “there is enough drug dealing on the other end of town probably not a good idea to add to it”. I’ve not hidden the fact that I grew up in affordable housing. So these comments that say its occupants are drug addicts, criminals, problems and burdens is very hurtful. I can appreciate TBNA’s attempts on their page to celebrate when housing is announced in Ithaca, but honestly in this context it just reads as a selfish desire that those less well-off will go elsewhere and stay out of the village. For a community that prides itself on its social progressiveness, it’s very disappointing. 1. The Old Library redevelopment is creeping forward. The Old Library Committee of the Tompkins County Legislature voted to recommend the sale of the property for the previously stated amount of $925,000 to Travis-Hyde. With that vote, it goes forward to the full legislature for a vote on September 5th, where there are no major challenges expected. The Library Committee vote was 4-1, with legislator Dooley Kiefer (D-Cayuga Heights) opposed. Kiefer has always been opposed to any sale, and has long advocated for a lease of the land – and the only way the lease made any practical sense was by being 50 years in length, so that any investment could have the possibility of being recuperated. Given that she’ll probably vote no again for consistency’s sake, and perhaps a rejection from legislator Anna Kelles (D-Ithaca) because she was a long-time proponent of the condo plan, there aren’t likely to be any other opposition votes from the 15-member legislature. Once the sale is okayed, site prep for the 58-unit mixed-use senior facility at 310-314 North Cayuga Street can begin by the end of the year, with a spring 2019 opening expected. 2. So when is an expansion truly an expansion? That’s the question raised by the Times’ recent coverage of a proposed renovation of the county jail, which faces issues with overcrowding, but whose expansion of holding cells is strongly opposed by a number of advocacy groups. The jail is shared with the Sheriff’s Department offices at the moment, and the combined facility at 779 Warren Road is collectively referred to as the Public Safety Building. The ideal concept as pitched by the Sheriff’s Office would create an additional 13,000 square-foot administrative facility adjacent to the jail that would provide office space, conference space and locker rooms for officers. This would free up programmatic space in the PSB to be used for support functions like classrooms and counseling/meeting rooms, with the ultimate goal of reducing recidivism (the tendency of a convicted criminal to re-offend, and thus take up space in the jail). So,it’s not a jail expansion per se, but a support services expansion, which would probably drive debate among advocacy groups. The proposal is strictly conceptual, but the county is prepared to move forward with a formal study from LaBella Associates if requested. 3. At the latest Planning Board meeting, Lakeview’s 60-unit supportive and affordable housing plan was granted the green light to go forward to the next step, though not without reservation and concern from some local business owners and elected officials. Per the Times’ Matt Butler, 1st Ward councilors Cynthia Brock and George McGonigal spoke in opposition to the current plan, feeling it was too large and unattractive, while nearby business owners were uncomfortable with the population who would live there. 30 units would be set aside for those who are mostly independent but may need some degree of mental health support, 22 units are general affordable housing, and eight are for formerly homeless individuals. All units are one bedrooms. Lakeview will provide office and support space for services on the first floor of the 62,700 SF building. In other news, the debate over South Hill continued with the airing of grievances against student housing, Finger Lakes ReUse earned approval for its Elmira Road project, and someone must have left early, because the planning board failed to reach quorum (minimum attendance) to vote on recommendation of historic designation for the Chacona Block at 411-415 College Avenue. 4. Here’s an interesting little proposal out of Danby – a 10-unit pocket neighborhood. The project would be located on 2.2 acres at the rural intersection of Brown Road and Short Road, northeast of the hamlet of West Danby. The houses would be modular and modestly-sized with two basic styles, a 1.5-story cape and 1-story ranch. Additionally, they would be designed for aging-in-place, Net Zero Energy (zero net energy consumption), and have a shared common space (courtyard, lawn or similar), parking lot and septic system. The project, which has access to municipal water service, would require a zoning variance. The project is similar to the Amabel and Aurora Street pocket neighborhoods in Ithaca, though it’s a different developer – here, it’s Mike McLaughlin, a business owner from Newfield, and Danby residents Esther and Brooke Greenhouse. Esther was a team member in the condo proposal for the Old Library site. Although not explicit, these are likely for-sale units, possibly with a push towards seniors. With shared spaces, modular components and modest sizes, the cost for these is likely to be modest as well – they would likely be similar to the Lansing Community Cottages price range of $175k-$225k. 5. After much debate, the Sun8 Dryden solar projects have been approved by the town planning board. The sites include a nearly 11 MW facility at 2150 Dryden Road, and an 18 MW facility along Turkey Hill and Dodge Roads. The projects will produce approximately 28 MW of electricity, which is enough to power the approximately 7,500 households. The project will utilize a Payment In Lieu of Taxes (PILOT) of $8,000/MW, or about $224,000 in year one of operation, and with built-in inflation, about $8 million over 20 years. Meanwhile, the town has begun review on a much smaller solar project at 2243 Dryden Road. Delaware River Solar is seeking approval to construct a 2.4 MW array on the interior portion of a farm property just west of the village near Ferguson Road. About 35 acres of the 115 acre parcel would be impacted during construction, with five acres used for the panels themselves. 6. In real estate listings, here’s something unusual for those who dare to be different – a Groton church, already renovated with living space and studio space. Aptly-located 113 Church Street is listed at $174,900 and 9,490 square feet on Zillow, but a check of county records says 9,166 SF – a 1,000 SF apartment, a 1,344 SF office, 4,078 SF “non-contributing space”, and 2,744 SF “cold storage”. The property was built in either 1881 or 1883 (county record) for a Congregational denomination, and after some mergers in the 1960s it became the Groton Community Church. From records and county file photos, it looks like the church building was re-purposed in the late 1990s or early 2000s. Previous tenants include a head start program, massage therapy, and art gallery. The tax assessment is for $100k, which seems to account for the old and somewhat mothballed condition of the property, such as the boarded up windows on the steeple tower. Should one be interested, contact info can be found in the first link. 7. This week’s news round-up is running a little early because I wanted to get the latest Trumansburg Hamilton Square materials out before the planning board meeting Thursday evening. Over the past few weeks, there haven’t too many changes to the project site plan, but the daycare center was moved from inside the loop road to outside, exchanging locations with a string of for-sale market-rate townhomes. The resulting move also seems to have decreased the number of market-rate units (some townhome, some detached single-family) down by one, to 14. 11 affordable for-sale townhomes and 47 affordable rental units are still in the mix. A copy of the traffic study from SRF Associates has also been made available on the project website. The traffic study aims to be thorough, and will likely be expanded in response to neighbor concerns about slower traffic like garbage trucks and school busses, snow impacts, and a possible sampling and estimation of school-focused but non-peak hours and a couple other intersections further from the project site (Rabbit Run Road, and Whig/South Streets). The meeting tomorrow will be at 7 PM at the Trumansburg Fire Hall. The actual submission of the project for formal board review is not expected until late next month, after incorporating feedback from the upcoming meeting. Along with private donations, the community advocacy organization is seeking state funds, which state law requires be obtained via municipal entities, i.e. the village, school district, town and county. It’s not that governing bodies have to commit money, they just have to express support and sign off on applications, and allocate the awarded funds if/when they are received. Phase two for the non-profit would be a community center, likely a re-purposed building, and phase three would be a pool, which is garnering significant community attention. Although the group hasn’t committed to a location (the rendering is completely conceptual), it is examining the feasibility of different sites in and around Trumansburg. Interested folks can contact or donate to the group here, or sign up for emails if they so like. 2. Cayuga Addiction Recovery Services (CARS) has finally received the money from a July 2016 grant award. Cayuga Addiction Recovery Services (CARS) will be using it toward a new 25-bed adult residential facility. The new facility will be built on the Trumansburg campus adjacent to a 60-bed facility on Mecklenburg Road, near the county line a couple miles to the southwest of Trumansburg. An undisclosed number of jobs are expected to be created. Founded in a Cornell U. fraternity house in 1972, CARS provides treatment, counseling, skills training and support services to help clients overcome addictions and rebuild lives. The current facility was opened in 2004. While the location is quite rural, the nature of the facility (rehab, focus on opioid abuse) is getting pushback from at least one town board member who doesn’t want it in the town (link, scroll down to 7-25-TB minutes). The plan has yet to go before the Ulysses planning board. 3. INHS made its name on home rehabs, and it looks to be making a return to its roots. The non-profit developer is asking the IURA for $41,378 towards the renovation of an existing 3-bedroom house on 828 Hector Street, which will then be sold to a low-moderate income family (80% AMI, about $41,000/year) and locked into the Community Housing Trust. The project cost is $238,041. $152,000 to buy the foreclosed property from Alternatives Federal Credit Union, $8,000 in closing/related costs, $60,000 in renovations, $5,000 contingency, $8,141 in other costs (legal/engineering), and $4,900 in marketing/realtor fees. The funding sources would be $144,163 from the sale, $15,000 from INHS’s loan fund (to cover the down payment for the buyer), $37,500 in equity and the $41,378 grant. A for-profit could renovate for cheaper, but federal and state guidelines say INHS has to hire those with a $1 million of liability insurance coverage, which takes many small contractors out of the equation. Side note, the city’s federal grant funding disbursement was dropped by $50,000, because HUD is an easy target in Washington. Luckily, Lakeview decided to forego its grant funds because they found the federal regulations unwieldy, which freed up a little over $43k to move around to cover most of the losses. 4. Speaking of Hector Street, it looks like Tiny Timbers is rolling out a pair of new spec plans for two lots on the city’s portion of West Hill. The house on the left, for 0.27 acre Lot 1, is a 1,040 SF 2 BD/1BA design listed at 187,900, which is a good value for a new house in the city. 0.26 acre Lot 2 is a 3 BD/2 BA 1,370 SF home listed at $222,900. Taking a guess based on the lot sizes, these are the wooded vacant lots west of 920 Hector. There’s a third vacant lot over there, but no listing yet. 5. On the city’s Project Review Committee meeting agenda, which is the same as the memo…not much. Lakeview’s 60-unit affordable housing project on the 700 Block of West Court Street will have its public hearing and determination of envrionmental significance, the last step in SEQR and the one before preliminary approval. Same goes for INHS’s 13-unit project on the 200 Block of Elm Street. Apart from related or minor zoning variances and review of proposed historic designation in Collegetown for the Chacona and Larkin Buildings (411-415 College and 403 College), the only other project for review is 217 Columbia, Charlie O’Connor’s. Which, as covered by my Voice colleague Kelsey O’Connor and by Matt Butler at the Times, did not go over well, though Charlie seemed willing to change plans to avert a firestorm. From a practical standpoint, I’d imagine he’s much more focused on his much larger 802 Dryden Road project, and this is small if hot potatoes. The 6-bedroom duplex (three beds each) is designed by Ithaca architect John Snyder. My own feeling is that a moratorium isn’t the answer, but if they wanted to roll out another TM-PUD so that Common Council gets to review plans as well as the Planning Board, then so be it. My issue with moratoriums is that local municipalities do a terrible job sticking to timelines and have to extend them again and again. Plus, there are projects like the Ithaka Terraces condos, or the new Tiny Timber single-family going up on Grandview, that aren’t the focus of the debate but would be ensnared by a blanket moratorium. Meanwhile in the town, the planning board discussion for next week will mostly focus on the NRP Ithaca Townhouses on West Hill. The revisions will be up for final approval, which would allow NRP to move forward with their 2018-19 Phase 1 buildout (66 units and a community center). Phase II (39 units) will follow in 2019-20. 6. In sales this week, the big one appears to be 808 East Seneca – 5 unit, 4,125 SF historic property just west of Collegetown in Ithaca’s East Hill neighborhood. List price was $1.575 million, and it sold for modestly less, $1.45 million, which is well above the $900,000 tax assessment. The sellers were a local couple had owned the property since 1982, and the buyer is an LLC formed by the Halkiopoulos family, one of Collegetown’s old Greek families, and medium-sized landlords with a number of other houses in the area. Perhaps more intriguing is the sale of 452 Floral Avenue for $100,000 to home builder Carl Lupo. The vacant 4.15 acre property had been the site of a 30-unit affordable owner-occupied project back in 1992, but given that the Ithaca economy was faltering in the early 1990s, the plans never moved forward. 7. A quick update from the Lansing Star about the Park Grove Realty lawsuit. While the Jonson family of developers may have lost the village elections by a large margin, their lawsuit accusing the village of an illegal zoning change to permit the project has been reviewed by the state’s court system – and they lost. The state supreme court ruled the zoning change was perfectly legal, appropriate to the revised Comprehensive Plan, and accusations of negative impacts on the Jonsons’ Heights of Lansing project are overblown and speculative. The Jonsons intend to file an appeal, and have to send in their final draft by September 5th. At this point, the project is left in a waiting pattern – the village is leaving the public hearing open until the appeal is resolved. If the appeal overturns the ruling, than the project can’t proceed regardless of village approval. Given the basis for the initial ruling, an overturning seems unlikely, but it will be a few more months before any approvals can be granted.